by Nicole Gulotta for Thrive Market Raise your hand if you could use an extra dose of “calmfulness” in your day. We didn’t make this word up, promise. 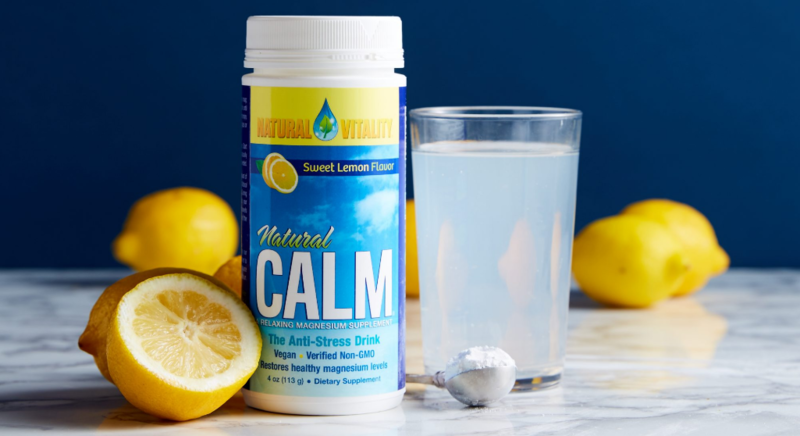 Calmfulness—a non-stressed and positive approach to life—was coined by wellness company Natural Vitality and serves as one of the brand’s core values. Austin-based Natural Vitality was founded in 1982 and creates its supplements with organic, plant-based ingredients like wholesome fruits and veggies. Its commitment to sustainable agriculture and soil restoration has evolved into the Calm Earth Project, and since 2007, Natural Vitality has donated a percentage of sales to organizations like Slow Food USA, Food Tank, Organics 4 Orphans, Heifer International, and more. One of its signature products is a magnesium supplement you can try in refreshing lemon or sweet orangeflavors. Magnesium is an essential mineral that plays a vital role in helping our bodies regulate other vitamins and minerals, and it’s used by nearly every organ, from the heart to the kidneys. Many of our Thrive Market members are already big fans. Rosemarie has used the supplement for a year and reports it helps her sleep better “without compromising energy levels the next day.” For Peg, working in retail means she spends hours on her feet, and before taking the supplement, she’d get cramps in her calves. Maylin uses it before bed and “feels very rested” the next morning. This bottle delivers 325mg of magnesium per serving, and both flavors are refreshing in water, but you can stir into juice, too. (One of our members stirs a spoonful into iced tea!) Start sipping, and see what it does for you!